A toddler, 2, was seriously hurt when she was knocked down and run over by an F-150 Ford pickup truck that was being driven by a boy, 14, at about 12:30 Holy Thursday afternoon at the corner of Sapodilla and East Guadalupe Streets in Trial Farm, Orange Walk District. The toddler, who miraculously survived, is presently in intensive care at the Karl Heusner Memorial Hospital, and her condition has been declared as critical but stable. She suffered internal injuries and her damaged spleen was removed during surgery at the Karl Heusner Memorial Hospital. 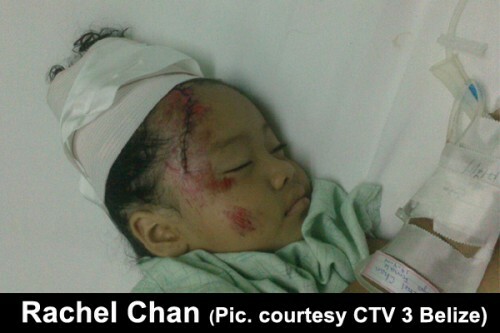 According to police, the toddler, Rachel Chan, was crossing the road when she was knocked down and run over by the pickup. She suffered a large cut wound on the forehead, in the temple area, among other injuries, said police. The vehicle did not stop immediately, but came to a stop at about 200 feet from where the child was hit. A good Samaritan who was in the area and saw what happened quickly took the youthful driver out of the pickup, took the pickup back to where the little girl was lying on the road, and took her to the Orange Walk Hospital in the pickup, because no other vehicle was available at the time. The child was later rushed to the Karl Heusner Memorial Hospital, where doctors worked to save her life. She is expected to be released from the hospital tomorrow, Thursday. Police said that the minor will be charged with driving without due care and attention, negligent grievous harm, driving without a driver’s license and failure to report an accident, and also, the owner of the pickup will be charged for allowing the boy to drive his vehicle. They will both be taken to the Orange Walk Magistrate’s Court on Tuesday, April 29.